My days begin in the dark, as early as 3 or 4 o’clock, with whatever book I was reading the night before (or the previous morning, if I happened to be too tired to read before falling asleep). Today my book was an advance reader’s copy of a title due out in the fall, Hard Cider, by Barbara Stark-Nemon, author of the award-winning Even in Darkness. The earlier work was set in 20th-century Europe. Most of the story in Hard Cider takes place right here in Leelanau County. Before settling down to my book, however, I step outside for a minute to admire the moon over the barn. The first hint of first light brings sounds of morning’s earliest birds. Are they hungry? I am. Toasted English muffin with cheddar cheese and refried black beans is today’s solution, and I fix a peanut butter kong for Sarah, my early morning companion. She cares nothing for coffee but loves to start the day with a peanut butter snack, after which she looks to me for the last bite of whatever I’m eating. Her expectations are learned, but we don’t mind: we taught her, after all, and her manners are exquisite. At “quite-light” but still well before sunrise, Saran and I go outdoors, where my straw bale gardening needs watering. As for Sarah, she has important business and exploring to do before she comes back to lie in the grass near where I’m working, continuing to monitor the air with twitching nose. An old, beat-up plastic children’s sled still functions to move certain objects from one part of the yard to another. Today a box of lettuce seedlings asks for sunnier placement. Then it’s back indoors to throw a load of laundry in. By the time the sun is up, the wash will be ready to go out on the line, and meanwhile another cup of coffee is in order, this time outdoors on our boardwalk, where spires of delphiniums are beginning to open to the warm air. Poet and essayist Fleda Brown, my second Thursday Evening Author of the season, was a delight, as always! I was grateful to her for making the trip out to Northport from Traverse City, and we both appreciated the number of people who turned out for an evening poetry reading. Thanks to a miraculous and mysterious memory flash, I even remembered to get a photo of my guest and myself together for a change. Thanks to the Artist, a.k.a. David Grath, for operating the camera (his), as well as for the loan of his gallery space for our TEA gatherings. And now June is almost over! How swiftly the weeks swoop past! Unbelievable. It’s strawberry season already. Coreopsis on the roadside (the “longest day” flower in my associative memory) is already moving over for sweet peas. And Friday mornings are farm market time in Northport, as one day tumbles after another. Can’t miss farm market! Still, it’s good to have these quiet, sweet morning hours in which to look around and catch my breath. There is no single theme to my gardening this year. 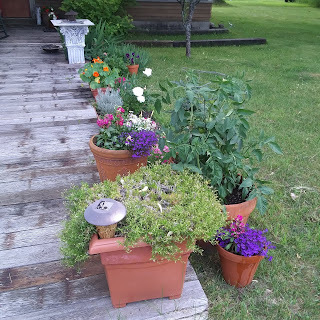 No limited color palette, as in some more restrained seasons.One summer, for instance, white, grey, blue, lavender, and purple were the only colors in my boardwalk garden. No red, no orange, no yellow. Subtlety was my guiding principle. This year I threw all restraint to the winds. Red and orange, pink and yellow, every shade of blue and violet from lightest to darkest, even tomatoes and herbs mixed in with perennials and annuals. Nothing ruled out, my boardwalk garden is a riot of diversity this summer, and I’m loving it! A similar broad brush paints my bookstore’s summer literary series, TEA, which stands for Thursday Evening Authors. My TEA guests are writers of fiction and nonfiction; books written for adults, for children, and for readers of all ages; poetry, history, travel, and memoir. Every week this summer will be something different, with no discernible theme other than that of celebration, as we celebrate books and writers, readers and reading, and 25 years of Dog Ears Books. I hope you will be able to join us for as many Thursdays as possible. 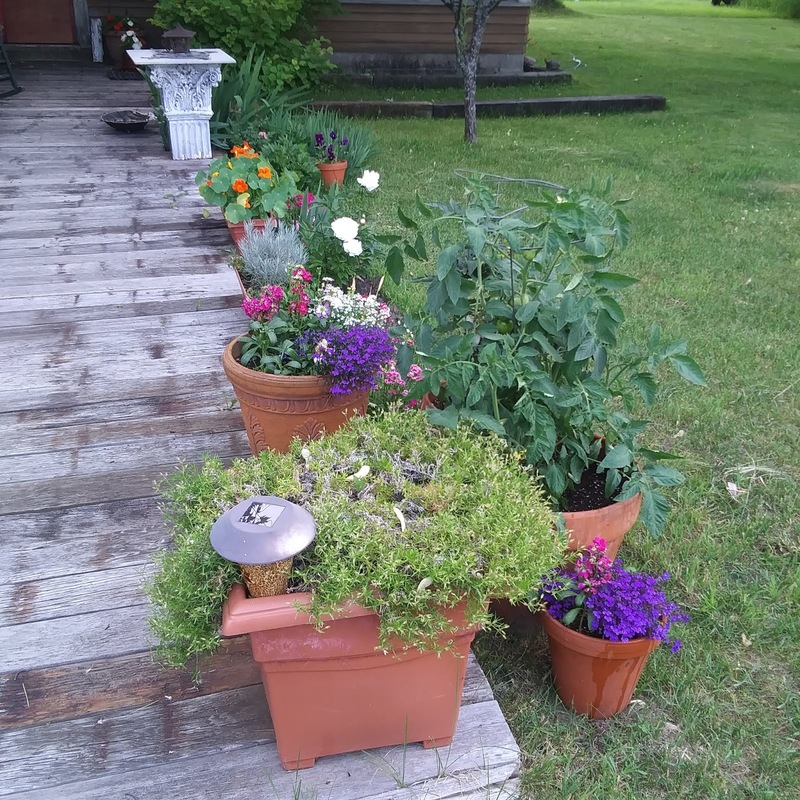 All TEA guests are either northern Michigan residents or have summer roots here (the latter the annuals in our literary garden). 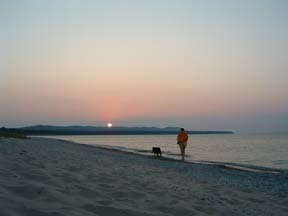 Among Michigan towns represented in this summer’s TEAs are Marquette, Traverse City, Suttons Bay, Empire, Omena, and Battle Creek. Our first guest of the season, Rachel May, from Northern Michigan University in the U.P., was delighted with her Northport audience, and the feeling was decidedly mutual. Meeting authors in person is an opportunity not only to see the person behind the book but also to learn some of what is involved in the writing process, which varies from one writer to another. Whether you are a writer yourself or simply curious about how people do it, this aspect of TEAs should prove interesting. I’ll post reminders as we go through the summer, (this list won’t be your only reference), but some of you might want or need to plan beyond the current week — hence the list. And do, by all means, plan to be with us this Thursday for Fleda Brown. You’ll thank yourself afterwards for having come to meet her! Deep Breath, First Tea -- and Maybe Riddles? You’re here now. Take a deep breath. I’m talking to myself. Yes, I often talk to myself, though sometimes under the pretense of talking to the dog, which somehow is not seen as quite so eccentric, although a bookseller, as I told my mother once, is supposed to be eccentric, especially a bookseller whose shop specializes in used books, so since the stereotype already exists, I might as well play it to my advantage. “What will people think?” They’ll think I fit the stereotype, of course. That I’m typical. — Or is ‘typical eccentric’ anything a contradiction in terms? Well, there I go, down a rabbit hole of pointless digression, but so what? It’s early morning … or was when I began writing this, hours and hours ago. On the morning after my first TEA event — Thursday Evening Authors, my summer literary series celebrating 25 years of Dog Ears Books — while in the backyard watering my straw bale garden in the early sunlight, with birds singing their hearts out all around me, I told myself, Take a deep breath. You’re here now. That is my mantra: You’re here now. Or, more prescriptively, Be here now. Summer is a busy time, but it’s important to stop and look around and listen to the birds and take those deep breaths. One reason I felt I could afford to relax a bit on Friday morning was that Thursday evening at the bookstore had gone so beautifully. Author Rachel May was so natural in her presentation, honest and forthright and well prepared, and the passages she read from her book were so full of detail that we in the audience had no trouble picturing the surroundings she described. Our audience was great, too — attentive, engaged, receptive — and the author appreciated their questions and clearly enjoyed answering. The house was full! We sold out of books! A great start to the series and to the season! And I'm still hearing from people who loved the evening and are loving the book. Next Thursday (all Thursday events begin at 7 p.m.) is poet and essayist Fleda Brown, and on July 5 we’ll have travel writer Kim Schneider, and we’ll just keep going on from there, all through July and August. One friend e-mailed me last week or so that she needed a break from Emily, that there was just too much death and mourning in the poems, and there is a lot, which led me to thinking that death, always a major topic for poets, was particularly so in the 19th century. It was the poetic fashion, one might say. For example, one of my mother’s favorite poems was William Cullen Bryant’s “Thanatopsis,” written when the poet was only 17 years old. “So live, that when thy summons comes to join/The innumerable caravan which moves/To that mysterious realm where each shall take/His chamber in the silent halls of death….” Read the entire poem and see what you think of it. Is it depressing? Morbid? It doesn’t seem so to me. Rather, immersion in nature, along with thoughts of life’s brevity and death’s inevitability, seem both prescriptive and consolatory. And I see the same themes working out in Emily Dickinson’s poetry. People in that age lived closer to death on a daily basis than most Americans do today. We keep it at arm's length. But maybe we are the ones who have the morbid attitude? My other thought — and this might be a bit far out — is that many of Dickinson’s poems remind me of the literary riddles so popular among the educated classes in the 18th and 19th centuries -- not the simple question riddles but those in the form of verse. In truth however, it is my compulsive re-reading of Jane Austen that brought the riddle idea to my mind when reading Dickinson. In Jane Austen’s Emma, one of the plot lines rests in part on the collection of “charades” that Emma encourages her young protegée, Harriet Smith, to put together. Could some of Emily Dickinson’s poems be riddles? Or is this a very naive and unliterary question to ask? Anyway, I quite like all the flowers and bees in Emily’s poems. Lots of bees! Full of life, bees and flowers. And now, Saturday morning, time to take to the road but also, I'm happy to realize, sufficient time to take the slow back roads to town, on my way to errands and another day in my bookstore. The world is lush and green and overflowing with life and death. It is a plenitude. We're here now. And today -- tonight -- is St. John's Eve. Summer kicked into high gear early this year, it seems. No sooner did our little reading circle, a.k.a. (originally, years ago) the intrepid Ulysses reading group, choose a date to discuss the poetry of Emily Dickinson than the first member’s conflict arose, to be followed by another, and another, and another…. So while I didn’t have a specific conflict, we were so far from a quorum already that I didn’t feel terrible saying I could ill afford a social evening. I’m hoping Thursday evening will be cool enough for me to wear my old, worn, thrift shop quilted jacket (see above), the one that looks like someone’s great-grandmother made it (as is probably the case). It is the perfect attire in which to meet Rachel May, author of An American Quilt: Unfolding a Story of Family and Slavery, and introducing her to my Northport audience. The date is propitious, too, only two days after Juneteenth, the date commemorating the Emancipation Proclamation. And on that subject, let me say that I am concerned with proposed changes to school social studies standards for the State of Michigan. Sadly, this year Juneteenth (June 19), as well as my guest author’s appearance (June 21), come at a time when another group is suffering within our borders. As punishment for their attempt to enter the country — even those seeking asylum — parents have had their children taken from them, and children have been put in detention camps. True, this is not an entirely new development, but it seems to be worsening daily. And is it relevant that these camps are run by private companies, profiting from the misery of brown-skinned children? Is anyone else reminded of parents and children of enslaved Black people being separated? Of Native American children being forcibly removed from their families and put in residential schools? But Rachel May’s story is not one of unrelieved misery. Some of the people whose history she uncovers were able to make the transition to freedom. She is also, besides being a researcher, teacher, and writer, a devoted quilter, as well, and I know she will be happy to talk about her quilting life, what she has learned about quilts and outstanding American quilters, and how her approach to the craft has changed over time. So, crafters and historians and anyone eager to learn, welcome to our first Thursday Evening Author event. We'll begin at 7 p.m., and I hope you’ll be able to join us. We learned years ago in our household that an old dog is perfectly capable of learning a new trick. Our old dog, Nikki, was not the sharpest tool in the box. No matter. She was a stunning athlete, and she needed me. Then late in life, after many years with us, she accidentally pawed her water dish and flipped it over and was rewarded with having it immediately filled. Imagine our surprise when she took that lesson to heart and began to “flip her dish” whenever it was empty and she wanted to let us know it needed filling. "She flipped her dish! She figured something out!" Another trick she learned even later was how to open a door. For years, even when a door was ajar, unless it was open wide enough to permit her passage, that dog would simply stand there, patiently, nose pointing in the direction she wanted to go, waiting for someone to push the door open for her. Then one day -- probably accidentally -- she pushed it herself. Hey, it worked! Success went to her head, and she pushed doors open many times in her remaining years. She even, to her dog dad’s dismay, learned to scratch at a door to request admittance. It was to my dismay that one oft-scratched door received a new coat of paint after my sweet girl was gone. But this post isn’t really about dogs. It’s about me and my bookselling life. Twenty-five years in the trade, and I’ve never taken credit cards, but today I made my first credit card sale. Sigh! To say I was reluctant would be an understatement. To say I was apprehensive, again, would hardly cover the territory. But today I processed a sale with a credit card. So the old dog has learned a new trick. She has been dragged, at last, kicking and screaming into the twenty-first century. I’m not done with learning yet. Summer is a challenge for me, for us, every year. What is more lovely than a day in June — and how often does the grass in June need mowing! Home, yard, and bookstore: each could use full-time attention and care. But even if I were three people for those jobs, there is no point in living somewhere beautiful and not taking time to soak in its beauty, no point in living surrounded by books and not taking time to read. The Artist shares some of my challenges and has a few others of his own. Sarah is neither job or diversion. She is simply Constant Companion, an integral part of our lives, always there, making few demands, providing endless comfort to us both. Oh, loveliness of dog and books! We humans in the house, even when worn out by long days of work, sometimes find it difficult to sleep, minds chewing over tasks still undone. That’s when I get out of bed and into a book, escaping into someone else's world for a while. And so, overwhelmed recently (can one be “somewhat overwhelmed,” or is that an oxymoron?) by the rising tide of summer’s demands, I turned once again to Ellen Airgood’s South of Superior, reading it through for the fifth time. It’s good to visit that little Upper Peninsula town and spend time with my old friends there as they deal with the challenges in their lives — although these days I identify as much or more with old Gladys than with 35-year-old Madeline! When I woke at 3 a.m. the following night, I took Alexander McCall Smith’s Mma Ramotswe as my companion. In The Woman Who Walked in Sunshine, Mma Ramotswe takes a holiday from work and at first, finding herself at loose ends, she begins to speculate about how a black mamba snake might get into her kitchen and where it might hide. She replaced the egg and gazed at the food cupboard, trying to remember when it was that she had last tidied it. Never, she thought, I have never tidied the food cupboard. The thought made her smile. How many women were there in Botswana walking about with the guilty knowledge that they had never tidied the food cupboard? In my case, “never” would be an exaggeration, but “not for quite a while” would not. Should that task be undertaken today? Sigh! Must I? …the yard was ill kempt, which spoke volumes, as it always did. If you did not keep your yard in reasonable order, then your whole life would be similarly untidy. A messy yard told Mama Ramotswe everything she needed to know about its owner. Instantly I feel better! While Bruce was at the bookstore on Friday and I could have been tidying my cupboards (or cleaning out closets or scrubbing floors or washing windows), instead I had been out in the meadow, waging my annual war on autumn olive. I’ll never eradicate it — it is taking over the entire neighborhood, any and all bits of land that are not regularly tilled or mowed — but holding it at bay for as long as I’m here is important to me, and looking out now at the expanse cleared of its unwelcome presence gives me great satisfaction. The job isn’t finished, but another day or two should take care of it until next spring. I avoided another opportunity for housework by watering my straw bale garden and weeding and mowing grass in our outdoor dining area and around the straw bales. Our yard is not messy! Well, it has its cluttered corners (mostly in and around the old, dilapidated barns), but the general appearance is neat and welcoming and colorful with pots of flowers, and I would not be ashamed to have Mma Ramotswe drop by. I think she would focus on the bright, well-tended areas and understand that one woman — even one man and one woman, at our ages — cannot do everything we once did. After rescuing the little boy and installing him in a safer, more congenial living arrangement at her friend Mma Potokwane’s Orphan Farm, Mma Ramotswe sings aloud as she drives her tiny white van back to town. She has met a challenge, it’s a beautiful day, and no matter if people in other cars think she is a lunatic, Mma Ramotswe is happy, and she will sing! It was not a big change in the overall scale of things; it was not something that would be noted by more than a handful of people — at the most — but it was something to be pleased with, even to sing about. I was happy to have the rest of the book to look forward to later, after morning housework and time spent with friends in the afternoon and before a full day of errands in town on Monday. Sometimes making a “mistake” means a day turns out better. I distinctly heard Sarah Shoemaker say that her letter to the New York Times Book Review would appear in the June 17 issue, so why did I rush down to Lake Leelanau as soon as NJ’s opened on Sunday morning, expecting to read Sarah’s letter on June 10? Well, am I glad for having jumped the gun in this case, for the sake of the book review section, because under the headline “Underrated and Unappreciated” was a review of a new book about President Jimmy Carter, a book the reviewer calls “a measured and compelling account,” one that considers Carter’s weaknesses along with his strengths. The author of President Carter: The White House Years, Stuart Eizenstat, and the book reviewer, Peter Baker, both seem to share my own view, which is that Jimmy Carter’s presidency has never been properly evaluated. Instead, policies that might very well have led us to a much better world than we find ourselves occupying today were largely undercut by the tone of his message. President Carter’s unflinching honesty compelled him to deliver bad news, hoping America would see its errors and change its ways, but it was the stick, not the carrot, a call to sacrifice, not “You can do it!” optimism. And so, while almost everyone admires him for his post-presidential work, his accomplishments in the White House are generally forgotten. Now comes President Carter: The White House Years from St. Martin’s Press to correct the national memory. It’s about time. When President Carter’s energy report came out in the 1970s, I was working in a university office concerned with environmental issues and so had a chance to leaf through that weighty tome in our office library. Before that, while I’d voted for him, I hadn’t been excited by Carter’s presidency. That energy report changed my attitude. I was excited by his ideas for energy independence, even if it meant higher gas and oil prices during a transition, and I began paying closer attention to everything he said and did. When he arranged a Middle East Peace Conference at Camp David, I hoped to see conflict permanently resolved in Israel. In general, I noticed with nothing short of amazement that when President Carter gave a press conference, he actually tried to answer the questions asked rather than wiggle out of answering! Incredible! Despite the unsettled weather an east wind always brings, Sunday was a lovely day. It brought work, and it brought friends. And at day’s end, tired and happy, I took up again The Woman Who Walked in Sunshine. Normally Mma Ramotswe would be up first and make tea for her still somnolent husband. This she would place on the dresser at the side of the bed before going out into the garden to inspect the plants, savour the crisp morning air, and watch the sun float up over the horizon. In our house, it is coffee rather than tea in the morning, and Mma Ramotswe has no dog, but otherwise the morning routine in the novel pretty closely mirrors my own. (See above.) Another morning, another day. But first, the restfulness of a sweet, green June evening. Fresh ARC in hand from a writer whose work I have long admired -- always exciting! Valerie Trueblood’s new collection, to be released on August 7 of this year, will be a joy to those encountering her work for the first time, as well as to her long-time admirers. To call the book a “joy,” however, is in no way to suggest escapist fiction. Far from it. New stories in the Terrarium section, like those from earlier collections and from her novel, Seven Loves, run the gamut in tone from quixotic to grim, but all are realistic and compelling. This writer’s characters are real people — dreaming, trying, stumbling, falling, and going on as long as they can. In any collection, it’s difficult not to have favorites, and the story that hit me hardest in this new group was “Crisco.” In only four pages, the author weaves different strands together — the global world of spies and other news, a local high school basketball star, a young reporter, a beautiful killer horse, a baby given up for adoption, losses inflicted by a distant war — to form a complete world. “She did talk about her work,” Madeline told me when I asked. “Who, what, when, where why.” Was that all? “Well, she said you have to do that in her job. Know what the story is. She said that to John when he was shy.” But how, that was my question, how do you know what the story is? And if you do, how do you pull it, like a Slinky in the toy bin, out of the mass of everything else? The quote above comes from the middle of the story (nearly its geographical center), and the question recurs in the final paragraph, where the narrator suggests possible answers to “What is the story?” That list of possibilities was nearly enough to break this reader’s heart! As always with Trueblood’s writing, however, all remains simplicity, even the all-too-human confusion brought to the question — and this is a paradox, friends, not a contradiction. Again, realistic. As a terrarium is a small, enclosed world, a miniature portion of earth, just so do many of the Terrarium stories show the author experimenting with more condensed pieces than appeared in her earlier short story collections, Search Party; Marry or Burn, and Criminals: Love Stories. One of the stories in the volume Criminals, “Sleepover,” almost feels like novella, whereas “Harvest,” in the new book, is a single paragraph, and neither, of course, is wrong. A story (like a poem) should be as long as it needs to be and no longer. It is Trueblood’s gift to have such an unerring feel for what is necessary and to pare away the rest. I’ve been thinking once again in general about short stories, a recurrent subject of my bookseller musings, and it strikes me that the readers who most appreciate the form are other writers. Whether their own work is fiction, nonfiction, or poetry, long or short forms, writers are more aware than any other readers of the level of craft that short fiction (like poetry) demands. A novel may wander or digress, without injury, but the writer of short stories must deny herself that self-indulgent luxury. In a short story, every word has to count. And here’s something else I noticed in the Terrarium stories. While not every question is answered and many puzzles are left unresolved, at any particular story’s last line I never had the feeling of having been pushed out of a speeding car and left on the side of the highway. I felt satisfied. Not necessarily in every case optimistic or relieved but always, in a literary sense, satisfied. Shall I add that dogs figure into many of the stories? Is that an extraneous, irrelevant detail? I have nothing like Valerie’s gift for writing, but her stories are gifts to all readers. After a week of balmy summer, Nature today has carried us back to spring with a second wet morning in a row, this one cool enough for a jacket, though sweater and raincoat may be more appropriate. Yes, rain. Rain means a break from mowing grass — and also encourages the grass to grow all the more lushly. Everything is a double-edged sword. Yesterday morning I came to the last page of Rachel May’s An American Quilt: Unfolding a Story of Family and Slavery, and today I feel challenged to get across to male readers, many of whom will have little or no interest in domestic arts (am I stereotyping? ), that this is not just a “book about quilts.” It is much more. Though there is plenty of information about quilts and several other examples of quilts made in the early years of the Republic, for author May the 200-year-old quilt tops encountered in the book’s pages are pieces of material culture that first open the door to decades of American history in which she will subsequently immerse herself and her readers. What May pieces together in her book are lives. But here I want to go in another direction for a while, because May will be the best narrator of her own story and I don’t want to pre-empt anyone’s reading and listening of that. Also, my digression has a definite purpose, connected to May's book, so once again I ask you go come with me on a little detour. Old books. Some people have no use for them, especially old history books, but for me the age of a book, the era in which it was written, is never a reason to pass by without opening the pages. “Outdated” is not a term I usually recognize. Many of today’s perspectives will surely be discarded in the future, so why should we necessarily valorize them over other views, merely because they are current? For me, the calendar cannot be a yardstick for value. And just as some past views require correction in the present and will require additional correction in the future, surely other perspectives of the past may be resuscitated and one day seen as superior to what is commonly believed today. It has happened before, and it will happen again. The “old” book I picked up yesterday afternoon — actually, I initially picked it up months ago and have had it tucked away in the car for an occasion that finally arrived yesterday, an hour when I would be waiting in the car for the Artist and would need something to read — is a book of essays on the philosophy of history, essays gathered together and published in 1959. It is The Philosophy of History in Our Time: An Anthology, selected and edited by Hans Meyerhoff, and in the parking lot of the Suttons Bay library as afternoon segued into evening I had the opportunity to dip into the first essay in the collection to catch my eye, “The Historical Imagination,” by R. G. Collingwood. Revisionist history. There is another phrase used as one of depreciation and often uttered with a sneer. The common connotation, nurtured by many who consider themselves lovers — even practitioners — of history, is that to revise history is to falsify it. And of course intentional falsifications have occurred from time to time. But not every revision is a distortion. I would venture to say that most revisions are corrections and clarifications rather than distortions, and here Collingwood comes to my aid, as well as serving to bolster the work of Rachel May, which is the reason for my digression today. Collingwood begins by setting forth what he believes is most people’s first “commonsense” theory of history, in which the essential features are memory and authority. According to this view, an authority is someone with memory of an event, and subsequent historians remain true insofar as they rely on facts set forth by authorities. Collingwood challenges this view and insists on the historian’s autonomy, that he or she (for Collingwood, always “he,” but no matter) must always be his or her own authority. As natural science finds its proper method when the scientist, in Bacon’s metaphor, puts Nature to the question, tortures her by experiment in order to wring from her answers to his own questions, so history finds its proper method when the historical puts his authorities in the witness-box, and by cross-questioning extorts from them information which in their original statements they have withheld, either because they did not wish to give it or because they did not possess it. So much for authority, although I am not giving you every step or every example in Collingwood’s refutation. What about memory? Will that not be essential? And as history does not depend on authority, so it does not depend upon memory. The historian can rediscover what has been completely forgotten. … He can even discover what, until he discovered it, no one ever knew to have happened at all. What, though, about facts? The question of facts, which seemed more or less settled to the commonsense imagination, has once again become contentious, and Collingwood insists that for the historian facts about the past are always contentious, that there are no “bare facts” that can serve as fixed points on which to pin a complete history. No authorities, no fixed points, no data. Another philosopher of history in the same old book, Carl Becker, addresses himself to the question of historical facts and takes as his example that Caesar crossed the Rubicon. What of it? he asks. Many people have crossed rivers, many even have undoubtedly crossed the Rubicon, and certainly in saying “Caesar” crossed it we mean that he did so with an army, and when we look at this “simple fact” closely, we see that thousands of other facts must have gone into it and have been left out of the story. Historians are always selecting and omitting. All that the historian means, when he describes certain historical facts as his data, is that for the purposes of a particular piece of work there are certain historical problems relevant to that work which for the present he proposes to treat as settled; though, if they are settled, it is only because historical thinking has settled them in the past, and they remain settled only until he or some one else decides to reopen them. I have italicized that sentence and left it standing alone because for me it shines light on Rachel May’s imaginative reconstruction of nineteenth-century lives, both black and white, beginning with an unfinished quilt. Collingwood goes on. Everything is evidence which the historian can use as evidence. But what can he so use? I must be something here and now perceptible to him: this written page, this spoken utterance, this building, this finger-print. And of all the things perceptible to him there is not one which he might not conceivably use as evidence on some question, if he came to it with the right question in mind. I read: This quilt. This box of letters. These printed images. These houses and the much more simple buildings behind them. Historical markers in certain places, their absence in others. History is never finished, once and for all, writes Collingwood, but this is not an argument for skepticism. History is a process, and the historian is part of that process. [E]very new generation must rewrite history in its own way; every new historian, not content with giving new answers to old questions, must revise the questions themselves…. And here is the heart of important revision, it seems to me. “Settled” history, that which we learn in grade school, answers a limited set of questions, but as we grow older we realize how many questions were never asked in those books. Could New Englanders have become so wealthy with their cotton mills if not for cheap raw material from the South, its very cheapness made possible only by the institution of slavery? What picture does the word “slave” bring to mind? How might it be possible to give a fuller picture not only of national economics in the nineteenth century but also of individual human lives? How can we possibly imagine what might have been going on in the minds of those who could see other human beings as property, in the minds of those who were considered little more than livestock or chattel? Much necessary historical revision is enlargement. It looks to answer questions that previous historians did not ask (or dismissed from consideration), and it looks to give voice to what has hitherto been kept silent. It is not suppression of truth but the bringing to light of more truth than had been made easily available before. What historical facts will you accept? What answers? What stories? Each of us who reads history is a student of it, and the more we read and learn, the more critically we can assess what we read, by putting it in the witness-box of our own imaginations and cross-questioning it. Every present has a past of its own…. It is this truth, in part, that drives Rachel May’s investigations. Just as she asked about Southern slave-owners, how they could come to a comfortable acceptance of owning other human beings, so she also asks of our time, how did we come to be where we are today? What questions have we failed to ask ourselves? What are we not seeing, and whose voices are we not hearing, whether willfully or ignorantly? Rachel May will be my first Thursday Evening Author, presenting her story of historical reconstruction at Dog Ears Books on June 21, beginning at 7 p.m. She is, I should add for the reassurance of crafters, a serious quilter herself and a student of historical patterns and methods of quilting, as well as a researcher of documents and places, so she will have something to offer every member of the audience, and I hope the audience for her presentation will be numerous.